British Prime Minister Theresa May has said the country’s terror threat level has been raised to its highest level of "critical," meaning an attack may be imminent. She made the announcement late on May 23, a day after a suicide bomber detonated an explosive device after a concert in Manchester, killing 22 people. Bombing suspect Salman Abedi may have been part of a bigger network, the prime minister said, adding that the man was born and raised in Britain. She also said the government had triggered Operation Temperer, an emergency plan to put soldiers into key public locations to support armed police. Manchester police said they arrested a 23-year-old man in connection with the Manchester attack. The extremist group Islamic State (IS) has claimed responsibility, though U.S. officials said they could still not confirm the group’s claim. Thousands of people gathered at Manchester’s Albert Square to mourn the 22 killed, many of them children or teenagers. Bathed in the evening sunshine, the packed square fell silent for a minute after several civic officials and poet Tony Walsh praised the city's spirit and solidarity in the face of the deadly attack. Other cities around the world followed suit. In Rome, the city said lights at the ancient Colosseum, Trevi Fountain, and city hall would be turned off to honor the victims. Officials in Paris said the Eiffel Tower would do the same, while at the Cannes Film Festival, a moment of silence was held to honor the victims. New York City said it has heightened security at high-profile locations. UEFA, European soccer's ruling body, announced that it would hold a minute of silence before Manchester United plays Ajax in Stockholm in the Europa League final on May 24 and that the opening ceremony would be "considerably reduced." Speaking earlier on May 23 after chairing an emergency response meeting in London, May said police and security services were "working at speed to establish a clear picture" of what she called a “callous terrorist attack.”. Greater Manchester Police's Chief Constable Ian Hopkins said on May 23 that the suspect bomber, Abedi, was 22, but gave no further details. "Priority is to continue to investigate whether he was acting alone or working as part of a wider network," Hopkins added. The Daily Telegraph newspaper reported that Abedi was born in Manchester in 1994 and that his parents had come to England as refugees from Libya looking to escape the regime of Muammar Qaddafi. 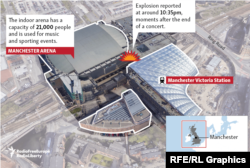 Witnesses at the 20,000-capacity Manchester Arena said they heard a "massive explosion" at around 10:35 p.m. local time on May 22, moments after U.S. singer Ariana Grande had finished performing. German Chancellor Angela Merkel voiced "sorrow and horror" over the attack, saying on May 23 that Germany would stand by Britain in the fight against terror. French President Emmanuel Macron also expressed "horror" at the attack, some of whose victims were children, and said he would speak to Theresa May. The shopping center was reopened within an hour after police arrested one man there. Authorities said the arrested man was not thought to have been linked to the May 22 terrorist attack. Later, London's Metropolitan Police said they had determined that the package was "not suspicious."